The HQS-Y01 GPS central digital clock displaying the current time served in schools, facilities, logistics centers, factories, etc.. If necessary, controls may have recourse, for example. ring, signal, or other equipment operation. The GPS satellite signal due to the accuracy is guaranteed. 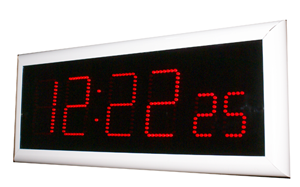 The clock can operate as a separate installation time HH: PPSS (date YY.MM DD, HH ° C temperature or optionally other information) or as a clock system central display unit. The quality of the display device has a built-in sensor that can measure the surrounding light intensity and automatically adjusts the display brightness based on. Built-in GPS receiver connector, RS485 communication and radio connection. Display: 6-Digit, 7 segment super-strong (4000 μC) red LED diodes and assembled. Visibility: 1m up to 130m. A digit dimensions: HH: MM - height 118mm, width 70mm, SS - height 72mm, width 45mm. Consumption: min. 1.2V, max. 12VA (luminance depending on the display). Dimensions: Height 246mm, width 613mm, thickness: 51mm. Connections: 4 pole connected to the GPS module for RS485 connector for connection for the radio.